The Mercure Hotel has opened up its function area for us to accommodate an extra 20 people for the Saturday night dinner so bookings for the Drive & Dinner are open until these few extra spots are filled.. 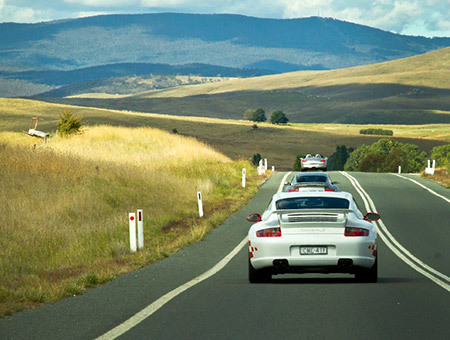 If you like driving your Porsche for long distances over interesting and well -sealed roads and enjoy the company and camaraderie of like- minded enthusiasts in the beautiful mid-North Coast of NSW in the springtime then this is the must weekend away for you. The drive will start at 8am on the Saturday from the Old Berowra Toll Gates (next the Herfo’s Woodshed) and primarily drive straight up the Freeway north to Port Macquarie (Port) with a couple interesting diversions to give us a break from the boring Freeway. Arriving early Saturday afternoon at Port in the early afternoon to for a self-organised late lunch and wander around town. The organised 3 course Dinner (excl. beverages) on Saturday evening is at the Mercure Hotel and it is recommended that you stay here for the weekend as the Mercure has provided a Special Offer for PCNSW members & guests for this event. The Mercure Centro Hotel, Port Macquarie would like to offer the Porsche Club NSW a special accommodation rate of $159 single or $179 twin/double share room per night including full breakfast & secure hotel parking for Saturday 24th & Sunday 25th October 2015. Please mention you are from PCNSW at the time of booking for this offer which is only valid if you book before 24 Sept 2015. It is strongly recommended you book ASAP as weekend accommodation in Port fills very quickly, particularly around Spring time. An early 7am start for breakfast on the Sunday morning for an 8am on-the-road for the Big Drive through the Port hinterland through to Walcha and a self-catered lunch stop at Armidale and then onto Dorrigo, Bellingen and back to Port (approx. 550kms and 8 to 9 hrs subject to stops). For those who cannot stay the whole weekend and have to get back to Sydney on the Sunday can join the first and most interesting stage of the drive to Walcha where they can peel off and head back to Sydney via the New England Hwy or just sleep in and head back via the Pacific Hwy. For those staying the Sunday evening we are planning another dinner venue by the river and attendees order and pay for their own meals at the time. The timing and route of the return trip Sydney on the Monday will be at individuals own choice.